The whirlwind weekend continued when my brother, his girlfriend, and I drove into NYC Friday after Thanksgiving. The plan was to meet up with my cousins up north and then train down towards the High Line. This stunning ped path has been on my brother’s ‘to see’ list and he was excited to check it out. We planned to stop for lunch first and somehow stumbled upon this legit German beer garden in the meat packing district. We snacked on pretzels and beer and played a little ping pong. Then made our way to the High Line. The path was busy as the sun was just starting to set. There is some interesting art work, unique architecture, and beautiful 360 degree views along the path. We all remarked how neat it would be to live so close to such a cool place! It was a chilly but fun way to spend the afternoon! When we started to feel cold, we popped back into a local bar for some mulled cider and a pre dinner snack. Then made our way back along the High Line after sunset, which was remarkable! We ate dinner at posh restaurant near the start of the High Line passing Cameron Diaz (we think, maybe) on our way out the door. My cousin’s wife and son headed back home while the 4 of us embarked on what can only be described as an impromptu bar crawl. We found some life music, the oldest pub in Manhattan, and ski ball (which apparently I rock at!). And then the evening ended at the BOY’s all time favorite place in all of New York! You can guarantee that I sent him this picture as he was studying for finals back home in Chicago and jealous doesn’t even begin to describe it! He called requesting I bring him home some pastrami, and this picture has become the new background of his phone. BTW, I would be willing to bet that in at least one photo on this blog has the BOY sporting his Katz’s Deli shirt because he travels with it EVERYWHERE. I am a huge fan of New York and love spending time in NYC. Getting to spend some QT with my cousin and his family along with my brother and girlfriend was memorable! It definitely took us me some time and sleep to recover for our adventure, but it was well worth it! We had one last day in New York/New Jersey to catch up with some old friends of my parents and celebrate another night of Hanukkah with my family. Everyone is already looking forward to coming to Chicago for my brother’s wedding next summer and many more Thanksgiving traditions have been started! Who has been to the High Line? Have you ever eaten at Katz’s Deli? I’m afraid I’m with the boy on the Katz’s thing-you can’t beat it for a Deli! When I lived in NYC there were 4 delis on my way home from work-most are little Mom and Pop delis (kind of like our subways) and I could always stop for a bagel with whatever on it-one of them made the best chopped egg salad and chopped liver. Not the healthiest but at the time I was in my 20’s and didn’t really know anything about nutrition. Ha ha! I love it! A deli on EVERY corner in New York and some amazing food! It’s hard to get good pastrami in Chicago, so I hear, which is why he loves those trips to NY! delis for our family on both coasts! Katz’s & Canter’s http://www.cantersdeli.com/ ! Now we need some in Chicago! Sounds like a blast, especially the impromptu pub crawl! I loved eating at different delis in NYC. I’ll have to check that one out next time we make it back! You should!!! And then let me know what you think. I don’t have much to compare it to but I do love the food in NYC! The pub crawl was super fun and a great way for all of us to chat about life! LoL! I bet you can! It was my first time there and I can’t wait to go back! You will definitely need to visit the high line. It is a wonderful piece of space in the chaos of NYC! That pretzel looks amazing!! High line is on my list next time I visit the city. Sounds like an awesome night in NYC. I love that city!! Great pictures! It is one of my fave places to visit too!!! And every time I’m there I love a good street pretzel. 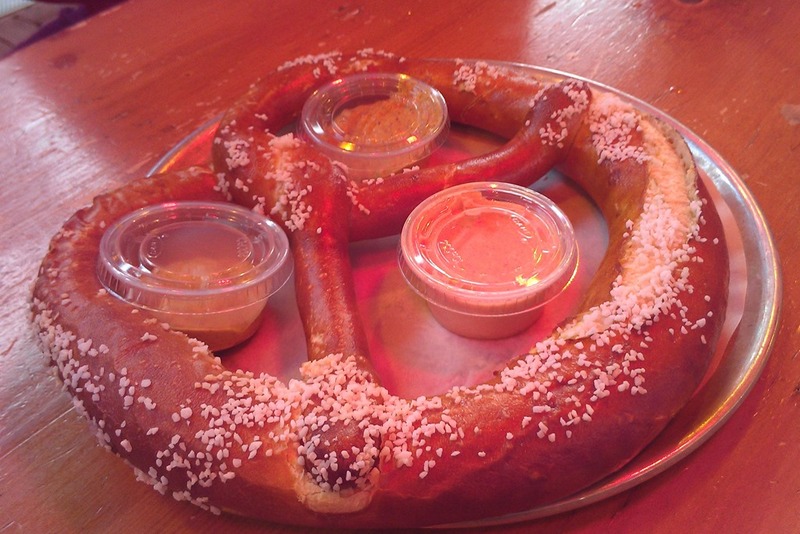 The German pretzel was just as good.